Duponchelle, Valerie. “Jeff Koons, quand l’art fait son show.” Le Figaro 29 October 2010, p. 16, illustrated in color. Jones, Jonathan. "Opportunist or moral satirist?" The Guardian Weekly 31 July 2009, p. 34-35 illustrated in color. Hensher, Philip. "Jeff's giant lobster is a red herring." The Mail on Sunday 19 July 2009, p. 17, illustrated in color (installation view, Serpentine Gallery, London, 2009). Darwent, Charles. "Behind the banality, still the big questions." The Independent on Sunday 5 July 2009, pp. 51, 53. Ward, Ossian. "Hello sailor!" Time Out London 2 July 2009, pp. 20-21, illustrated in color (partial, with the artist). Metro [London] 1 July 2009, p. 7, illustrated in color (partial, with the artist). Akbar, Afrika. 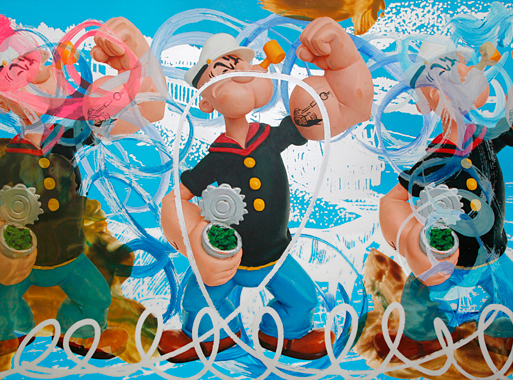 "Koons brings his 'toons to town." The Independent [London] 1 July 2009, p. 11, illustrated in color (partial, with the artist). The Guardian 30 June 2009, G2 cover, illustrated in color (detail).